John Moore and Dennis Caplinger of Bluegrass Etc. Taught Nickel Creek to Play. We have the privilege of having John Moore (Mandolin, Guitar) and Dennis Caplinger (Fiddle, Banjo) at our festival this year. Their group Bluegrass Etc. 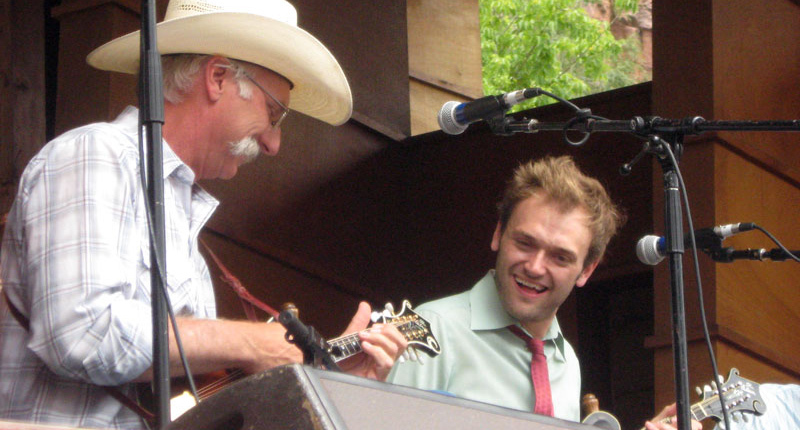 played at a pizza place in Southern California where a very young Chris Thile and Sean and Sara Watson of Nickel Creek caught the bluegrass bug. Moore and Caperling thought these young musicians to play their instruments. There is an interesting article on Thile and how this all came about in the San Francisco Classical Voice. What did you experience, along with the pizza? For me, I think it was as much the person playing the mandolin as it was the instrument itself. That was John Moore, who would eventually become my teacher, a very good player, also a very charismatic fellow. And I think, for a little kid, you’re just drawn to people like that, the leaders and people who shine brightly. I wanted to play the mandolin because he played it.